Tonight’s contest in The Sooner State will feature the league’s highest scoring team, the Thunder, at 105.7 ppg versus the NBA’s stingiest team defense, the Grizzlies, at 89.5 ppg allowed. The Grizzlies come to Oklahoma City without their leading scorer Rudy Gay. The 7th-year, 6’8” SF was traded along with reserve C Hamed Haddadi (1.2 ppg) to the Toronto Raptors after spending his entire career with Memphis. In return, the Griz got PG Jose Calderon and 3rd-year, 6’10” PF Ed Davis from north of the border. Memphis GM Chris Wallace then shipped Calderon to Detroit for 11th-year SF Tayshaun Prince and 4th-year, 6’11” F Austin Daye. New owner Robert Pera didn’t want to pay the steep luxury taxes the next two seasons, so Memphis cut salary while acquiring three quality forwards in exchange for one exceptional forward. The 29-15 Memphis squad has won five of their past seven games including a 103-100 victory at Philly on Monday. Rudy Gay scored the winning basket off his own rebound with 13.3 seconds left. He went for 26 points, 7 boards and 5 dimes in his last 48 as a Grizzly. Memphis’s starting 6th-year PG Mike Conley sat out the Philadelphia game with an ankle sprain. The ultra-quick Conley and his 13 ppg, 5.8 apg and 2.3 spg will be a game time decision tonight. The Thunder at 34-11 own the NBA’s second best record and are 19-3 in their own building. The league’s top scorer and MVP-frontrunner Kevin Durant and cast return home after a 3-3 road trip that ended on Sunday with a 105-96 loss to the Lakers. KD poured in 35, and PG Russell Westbrook had 17 points and 13 dimes on 6 for 22 shooting in the defeat. 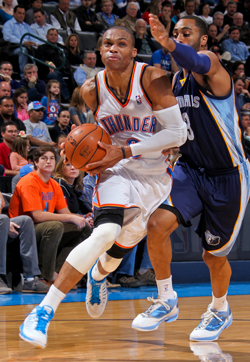 On November 14th, Memphis beat the Thunder in OKC 107-97. Gay had 28 points, 6 boards and 5 assists, while 2X All-Star Zach Randolph went for 20 points and 11 rebounds. 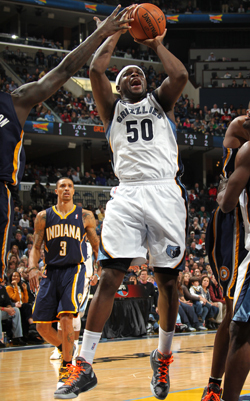 The Griz outscored the 2012 Western Conference Champs 36 to 15 in the pivotal second quarter. Tune in to TNT at 8:00 PM ET to see who will win the battle between the Thunder’s prolific offense and the Grizzlies’ shutdown defense. On Sunday the Celtics ended their 6-game losing streak with a 100-98 win over the Heat in double overtime. But Boston’s victory celebration was cut short when the team learned that All-Star PG Rajon Rondo will miss the rest of the season and beyond due to a torn ACL he sustained during Friday’s double OT loss to the Hawks. Rondo has averaged a league-leading 11.1 apg this year to go along with 13.7 ppg, 5.6 rpg and 1.8 spg in 37.4 mpg. This loss is devastating for the 21-23 C’s as they fight to regain the form that had them leading in the fourth quarter in Game 7 of the 2012 Eastern Conference Finals before succumbing to the Heat. Though Coach Doc Rivers has a few options on his bench, he’ll probably slide fifth-year combo guard Courtney Lee into the Celts’ starting lineup. 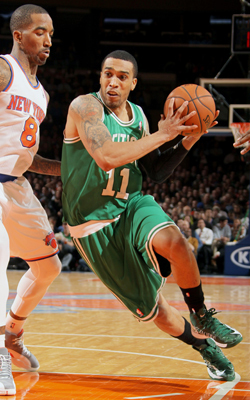 In his first season with the storied Celtics, Lee is averaging 7.3 ppg, 2.3 rpg, 1.4 apg and 1.1 spg in 22.7 mpg. Including Sunday’s W, Lee has started in 11 contests so far, covering for the injured Avery Bradley as well as for Rondo when he’s been out. Lee has season highs of 18 points, 5 dimes, 9 boards and 3 steals (8X). Whether at the PG or SG position, 27-year-old Lee has the experience and athleticism to help fill the huge void left by Rondo’s injury. With 14th-year, 6’2” SG Jason Terry suffering through one of his worst years statistically and shooting 38% since December 1st, Rivers will lean heavily on Lee to pick up some of Rondo’s minutes and production.